The story unfolds from the point-of-view of a young African American boy heading to his great-grandma Granny’s for an annual family reunion. The text is heavy with emotion, but none shine as boldly as joy. Alan, the narrator, has many conflicting emotions about the reunion and the celebration to honor Granny that is a big part of it. He’s excited to see family but sad he hasn’t come up with anything to share during the celebration. When Alan and his family arrive, he’s greeted by grandmas and grandpas, uncles and aunts, and more cousins than he can count. All his cousins seem to have thoughtful things to share with Granny, including scrapbooks, songs, and poems. After reflecting on his deep connection to the land and his family Alan eventually does find the perfect thing to share. Word and text dance on the page. Minter’s illustrations are deeply textured, and he uses color to prompt mood. Dialogue drips with vernacular sounds and sayings, bringing characters to life. Descriptions of the land, food, and fun give the story a strong sense of place. 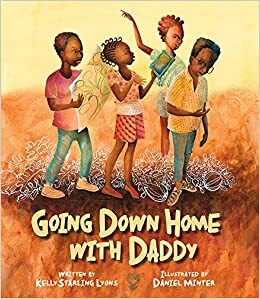 Going Home with Daddy is the perfect addition to family libraries. Whether your family has traditions that mirror Alan’s or different ones, the universality of emotions depicted can inspire us to be different together. You will need to wait a bit for this one, it will be released April 1, but it’s worth the wait. I accessed an advance copy at NetGalley.